For other uses, see Shock. Shock is divided into four main types based on the underlying cause: low volume, cardiogenic, obstructive, and distributive shock. Low volume shock may be from bleeding, vomiting, or pancreatitis. Cardiogenic shock may be due to a heart attack or cardiac contusion. Obstructive shock may be due to cardiac tamponade or a tension pneumothorax. Distributed shock may be due to sepsis, spinal cord injury, or certain overdoses. The diagnosis is generally based on a combination of symptoms, physical examination, and laboratory tests. A decreased pulse pressure (systolic blood pressure minus diastolic blood pressure) or a fast heart rate raises concerns. The heart rate divided by systolic blood pressure, known as the shock index (SI), of greater than 0.8 supports the diagnosis more than low blood pressure or a fast heart rate in isolation. Treatment of shock is based on the likely underlying cause. An open airway and sufficient breathing should be established. Any ongoing bleeding should be stopped, which may require surgery or embolization. Intravenous fluid, such as Ringer's lactate or packed red blood cells, is often given. Efforts to maintain a normal body temperature are also important. Vasopressors may be useful in certain cases. Shock is both common and has a high risk of death. In the United States about 1.2 million people present to the emergency room each year with shock and their risk of death is between 20 and 50%. The presentation of shock is variable with some people having only minimal symptoms such as confusion and weakness. While the general signs for all types of shock are low blood pressure, decreased urine output, and confusion, these may not always be present. While a fast heart rate is common, those on β-blockers, those who are athletic, and in 30% of cases of those with shock due to intra abdominal bleeding may have a normal or slow heart rate. Specific subtypes of shock may have additional symptoms. The severity of hemorrhagic shock can be graded on a 1–4 scale on the physical signs. This approximates to the effective loss of blood volume. The shock index (heart rate divided by systolic blood pressure) is a stronger predictor of the impact of blood loss than heart rate and blood pressure alone. This relationship has not been well established in pregnancy-related bleeding. Obstructive shock includes cardiac tamponade, pulmonary embolism, and tension pneumothorax. Distributive shock includes infectious, anaphylactic, endocrine (e.g., adrenal insufficiency), salicylate toxicity, and neurogenic causes. The SIRS features typically occur in early septic shock. Main manifestations are produced due to massive release of histamine which causes intense dilation of the blood vessels. People with septic shock will also likely be positive for the SIRS criteria. The most generally accepted treatment for these patients is early recognition of symptoms, and early administration of broad spectrum and organism specific antibiotics. Shock is a common end point of many medical conditions. Shock itself is a life-threatening condition as a result of compromised body circulation. It has been divided into four main types based on the underlying cause: hypovolemic, distributive, cardiogenic, and obstructive. A few additional classifications are occasionally used including: endocrinologic shock. Hypovolemic shock is the most common type of shock and is caused by insufficient circulating volume. Its primary cause is haemorrhage (internal or external), or loss of fluid from the circulation. Vomiting and diarrhea are the most common cause in children. Other causes include burns, environmental exposure, and excess urine loss due to diabetic ketoacidosis and diabetes insipidus. Cardiogenic shock is caused by the failure of the heart to pump effectively. This can be due to damage to the heart muscle, most often from a large myocardial infarction. Other causes of cardiogenic shock include dysrhythmias, cardiomyopathy/myocarditis, congestive heart failure (CHF), contusio cordis, or valvular heart disease problems. Obstructive shock is due to a physical obstruction of the great vessels or the heart itself. Several conditions can result in this form of shock. Cardiac tamponade in which fluid in the pericardium prevents inflow of blood into the heart (venous return). Constrictive pericarditis, in which the pericardium shrinks and hardens, is similar in presentation. Tension pneumothorax Through increased intrathoracic pressure, bloodflow to the heart is prevented (venous return). Pulmonary embolism is the result of a thromboembolic incident in the blood vessels of the lungs and hinders the return of blood to the heart. Hypertrophic sub-aortic stenosis is overly thick ventricular muscle dynamically occludes the ventricular outflow tract. Septic shock is the most common cause of distributive shock. Caused by an overwhelming systemic infection resulting in vasodilation leading to hypotension. 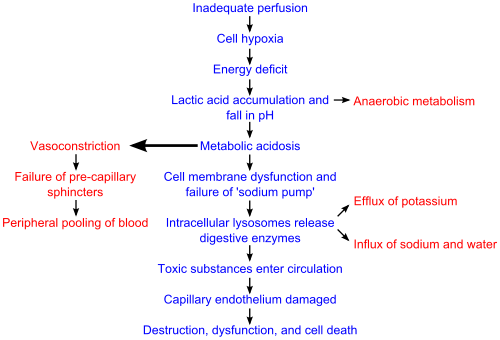 Septic shock can be caused by Gram negative bacteria such as (among others) Escherichia coli, Proteus species, Klebsiella pneumoniae which have an endotoxin on their surface which produces adverse biochemical, immunological and occasionally neurological effects which are harmful to the body, and other Gram-positive cocci, such as pneumococci and streptococci, and certain fungi as well as Gram-positive bacterial toxins. Septic shock also includes some elements of cardiogenic shock. In 1992, the ACCP/SCCM Consensus Conference Committee defined septic shock: ". . .sepsis-induced hypotension (systolic blood pressure < 90 mmHg or a reduction of 40 mmHg from baseline) despite adequate fluid resuscitation along with the presence of perfusion abnormalities that may include, but are not limited to, lactic acidosis, oliguria, or an acute alteration in mental status. Patients who are receiving inotropic or vasopressor agents may have a normalized blood pressure at the time that perfusion abnormalities are identified." Anaphylactic shock is caused by a severe anaphylactic reaction to an allergen, antigen, drug or foreign protein causing the release of histamine which causes widespread vasodilation, leading to hypotension and increased capillary permeability. Hypothyroidism (can be considered a form of cardiogenic shock) in people who are critically ill patients, reduces cardiac output and can lead to hypotension and respiratory insufficiency. Thyrotoxicosis (cardiogenic shock) may induce a reversible cardiomyopathy. Acute adrenal insufficiency (distributive shock) is frequently the result of discontinuing corticosteroid treatment without tapering the dosage. However, surgery and intercurrent disease in patients on corticosteroid therapy without adjusting the dosage to accommodate for increased requirements may also result in this condition. Effects of inadequate perfusion on cell function. There are four stages of shock. As it is a complex and continuous condition there is no sudden transition from one stage to the next. At a cellular level, shock is the process of oxygen demand becoming greater than oxygen supply. One of the key dangers of shock is that it progresses by a positive feedback mechanism. Poor blood supply leads to cellular damage, which results in an inflammatory response to increase blood flow to the affected area. This is normally very useful to match up blood supply level with tissue demand for nutrients. However, if enough tissue causes this, it will deprive vital nutrients from other parts of the body. Additionally, the ability of the circulatory system to meet this increase in demand causes saturation, and this is a major result, of which other parts of the body begin to respond in a similar way; thus, exacerbating the problem. Due to this chain of events, immediate treatment of shock is critical for survival. During this stage, the state of hypoperfusion causes hypoxia. Due to the lack of oxygen, the cells perform lactic acid fermentation. Since oxygen, the terminal electron acceptor in the electron transport chain, is not abundant, this slows down entry of pyruvate into the Krebs cycle, resulting in its accumulation. Accumulating pyruvate is converted to lactate by lactate dehydrogenase and hence lactate accumulates (causing lactic acidosis). This stage is characterised by the body employing physiological mechanisms, including neural, hormonal and bio-chemical mechanisms in an attempt to reverse the condition. As a result of the acidosis, the person will begin to hyperventilate in order to rid the body of carbon dioxide (CO2). CO2 indirectly acts to acidify the blood and by removing it the body is attempting to raise the pH of the blood. The baroreceptors in the arteries detect the resulting hypotension, and cause the release of epinephrine and norepinephrine. Norepinephrine causes predominately vasoconstriction with a mild increase in heart rate, whereas epinephrine predominately causes an increase in heart rate with a small effect on the vascular tone; the combined effect results in an increase in blood pressure. The renin–angiotensin axis is activated, and arginine vasopressin (Anti-diuretic hormone; ADH) is released to conserve fluid via the kidneys. These hormones cause the vasoconstriction of the kidneys, gastrointestinal tract, and other organs to divert blood to the heart, lungs and brain. The lack of blood to the renal system causes the characteristic low urine production. However the effects of the renin–angiotensin axis take time and are of little importance to the immediate homeostatic mediation of shock. Should the cause of the crisis not be successfully treated, the shock will proceed to the progressive stage and the compensatory mechanisms begin to fail. Due to the decreased perfusion of the cells, sodium ions build up within while potassium ions leak out. As anaerobic metabolism continues, increasing the body's metabolic acidosis, the arteriolar smooth muscle and precapillary sphincters relax such that blood remains in the capillaries. Due to this, the hydrostatic pressure will increase and, combined with histamine release, this will lead to leakage of fluid and protein into the surrounding tissues. As this fluid is lost, the blood concentration and viscosity increase, causing sludging of the micro-circulation. The prolonged vasoconstriction will also cause the vital organs to be compromised due to reduced perfusion. If the bowel becomes sufficiently ischemic, bacteria may enter the blood stream, resulting in the increased complication of endotoxic shock. At this stage, the vital organs have failed and the shock can no longer be reversed. Brain damage and cell death are occurring, and death will occur imminently. One of the primary reasons that shock is irreversible at this point is that much cellular ATP has been degraded into adenosine in the absence of oxygen as an electron receptor in the mitochondrial matrix. Adenosine easily perfuses out of cellular membranes into extracellular fluid, furthering capillary vasodilation, and then is transformed into uric acid. Because cells can only produce adenosine at a rate of about 2% of the cell's total need per hour, even restoring oxygen is futile at this point because there is no adenosine to phosphorylate into ATP. The first change seen in shock is an increased cardiac output followed by a decrease in mixed venous oxygen saturation (SmvO2) as measured in the pulmonary artery via a pulmonary artery catheter. Central venous oxygen saturation (ScvO2) as measured via a central line correlates well with SmvO2 and are easier to acquire. If shock progresses anaerobic metabolism will begin to occur with an increased blood lactic acid as the result. While many laboratory tests are typically performed there is no test that either makes or excludes the diagnosis. A chest X-ray or emergency department ultrasound may be useful to determine volume state. The best evidence exists for the treatment of septic shock in adults and as the pathophysiology appears similar in children and other types of shock treatment this has been extrapolated to these areas. Management may include securing the airway via intubation if necessary to decrease the work of breathing and for guarding against respiratory arrest. Oxygen supplementation, intravenous fluids, passive leg raising (not Trendelenburg position) should be started and blood transfusions added if blood loss is severe. It is important to keep the person warm to avoid hypothermia  as well as adequately manage pain and anxiety as these can increase oxygen consumption.Negative impact by shock is reversible if it's recognized and treated early in time. Aggressive intravenous fluids are recommended in most types of shock (e.g. 1–2 liter normal saline bolus over 10 minutes or 20 ml/kg in a child) which is usually instituted as the person is being further evaluated. Which intravenous fluid is superior, colloids or crystalloids, remains undetermined. Thus as crystalloids are less expensive they are recommended. [needs update] If the person remains in shock after initial resuscitation packed red blood cells should be administered to keep the hemoglobin greater than 100 g/l. For those with haemorrhagic shock the current evidence supports limiting the use of fluids for penetrating thorax and abdominal injuries allowing mild hypotension to persist (known as permissive hypotension). Targets include a mean arterial pressure of 60 mmHg, a systolic blood pressure of 70–90 mmHg, or until their adequate mentation and peripheral pulses. Hypertonic fluid may also be an option in this group. Vasopressors may be used if blood pressure does not improve with fluids. There is no evidence of substantial superiority of one vasopressor over another; however, using dopamine leads to an increased risk of arrythmia when compared with norepinephrine. Vasopressors have not been found to improve outcomes when used for hemorrhagic shock from trauma but may be of use in neurogenic shock. Activated protein C (Xigris) while once aggressively promoted for the management of septic shock has been found not to improve survival and is associated with a number of complications. Xigris was withdrawn from the market in 2011, and clinical trials were discontinued. The use of sodium bicarbonate is controversial as it has not been shown to improve outcomes. If used at all it should only be considered if the pH is less than 7.0. The goal of treatment is to achieve a urine output of greater than 0.5 ml/kg/h, a central venous pressure of 8–12 mmHg and a mean arterial pressure of 65–95 mmHg. In trauma the goal is to stop the bleeding which in many cases requires surgical interventions. Haemorrhagic shock occurs in about 1–2% of trauma cases. Up to one-third of people admitted to the intensive care unit (ICU) are in circulatory shock. Of these, cardiogenic shock accounts for approximately 20%, hypovolemic about 20%, and septic shock about 60% of cases. The prognosis of shock depends on the underlying cause and the nature and extent of concurrent problems. Hypovolemic, anaphylactic and neurogenic shock are readily treatable and respond well to medical therapy. Septic shock however, is a grave condition with a mortality rate between 30% and 50%. The prognosis of cardiogenic shock is even worse with a mortality rate between 70% and 90%. In 1972 Hinshaw and Cox suggested the classification system for shock which is still used today. ^ a b c d e f g h i j k l m n International Trauma Life Support for Emergency Care Providers (8 ed.). Pearson Education Limited. 2018. pp. 172–173. ISBN 978-1292-17084-8. ^ a b c d e f g h i j k l m ATLS - Advanced Trauma Life Support - Student Course Manual (10 ed.). American College of Surgeons. 2018. pp. 43–52, 135. ISBN 978-78-0-9968267. ^ a b c d Tabas, Jeffrey; Reynolds, Teri (2010). High Risk Emergencies, An Issue of Emergency Medicine Clinics - E-Book. Elsevier Health Sciences. p. 58. ISBN 978-1455700257. ^ a b Olaussen A, Blackburn T, Mitra B, Fitzgerald M (2014). "Review article: shock index for prediction of critical bleeding post-trauma: a systematic review". Emergency Medicine Australasia. 26 (3): 223–8. doi:10.1111/1742-6723.12232. PMID 24712642. ^ a b c d Guyton, Arthur; Hall, John (2006). "Chapter 24: Circulatory Shock and Physiology of Its Treatment". In Gruliow, Rebecca (ed.). Textbook of Medical Physiology (11th ed.). Philadelphia, Pennsylvania: Elsevier Inc. pp. 278–288. ISBN 978-0-7216-0240-0. ^ a b c d e f g h i j k l m n o Tintinalli, Judith E. (2010). Emergency Medicine: A Comprehensive Study Guide (Emergency Medicine (Tintinalli)). New York: McGraw-Hill Companies. pp. 165–172. ISBN 978-0-07-148480-0. ^ a b Tintinalli, Judith E. (2010). Emergency Medicine: A Comprehensive Study Guide (Emergency Medicine (Tintinalli)). New York: McGraw-Hill Companies. pp. 174–175. ISBN 978-0-07-148480-0. ^ Tintinalli, Judith E. (2010). Emergency Medicine: A Comprehensive Study Guide (Emergency Medicine (Tintinalli)). New York: McGraw-Hill Companies. ISBN 0-07-148480-9. ^ Pacagnella RC, Souza JP, Durocher J, Perel P, Blum J, Winikoff B, Gülmezoglu AM (2013). "A systematic review of the relationship between blood loss and clinical signs". PLoS ONE. 8 (3): e57594. doi:10.1371/journal.pone.0057594. PMC 3590203. PMID 23483915. ^ "American College of Chest Physicians/Society of Critical Care Medicine Consensus Conference: Definitions for sepsis and organ failure and guidelines for the use of innovative therapies in sepsis" (PDF). Critical Care Medicine. 20 (6): 864–74. 1992. doi:10.1097/00003246-199206000-00025. PMID 1597042. ^ "Surviving Sepsis Campaign Responds to ProCESS Trial" (PDF). Surviving Sepsis Campaign. Survivingsepsis.org. Retrieved 2015-03-25. ^ Elbers, Paul WG; Ince, Can (2006). "Bench-to-bedside review: Mechanisms of critical illness – classifying microcirculatory flow abnormalities in distributive shock". Critical Care. 10 (4): 221. doi:10.1186/cc4969. PMC 1750971. PMID 16879732. ^ a b c d e f g h i Silverman, Adam (Oct 2005). "Shock: A Common Pathway For Life-Threatening Pediatric Illnesses And Injuries". Pediatric Emergency Medicine Practice. 2 (10). ^ a b "Definition, classification, etiology, and pathophysiology of shock in adults". UpToDate. Retrieved 2019-02-22. ^ Tintinalli, Judith E. (2010). Emergency Medicine: A Comprehensive Study Guide (Emergency Medicine (Tintinalli)). New York: McGraw-Hill Companies. p. 168. ISBN 978-0-07-148480-0. ^ a b c Cocchi, MN; Kimlin, E; Walsh, M; Donnino, MW (August 2007). "Identification and resuscitation of the trauma patient in shock". Emergency Medicine Clinics of North America. 25 (3): 623–42, vii. CiteSeerX 10.1.1.688.9838. doi:10.1016/j.emc.2007.06.001. PMID 17826209. ^ Armstrong, D.J. (2004). Shock. In: Alexander, M.F., Fawcett, J.N., Runciman, P.J. Nursing Practice. Hospital and Home. The Adult. (2nd edition): Edinburgh: Churchill Livingstone. ^ Nolan, J. P.; Pullinger, R. (2014-03-07). "Hypovolaemic Shock". BMJ. BMJ. 348 (mar07 1): bmj.g1139. doi:10.1136/bmj.g1139. ISSN 1756-1833. PMID 24609389. ^ American College of Surgeons (2008). Atls, Advanced Trauma Life Support Program for Doctors. Amer College of Surgeons. p. 58. ISBN 978-1-880696-31-6. ^ Perel, Pablo; Roberts, Ian; Ker, Katharine (2013-02-28). "Colloids versus crystalloids for fluid resuscitation in critically ill patients". The Cochrane Database of Systematic Reviews (2): CD000567. doi:10.1002/14651858.CD000567.pub6. ISSN 1469-493X. PMID 23450531. ^ Marx, J (2010). Rosen's emergency medicine: concepts and clinical practice 7th edition. Philadelphia, PA: Mosby/Elsevier. p. 2467. ISBN 978-0-323-05472-0. ^ a b c Cherkas, David (Nov 2011). "Traumatic Hemorrhagic Shock: Advances In Fluid Management". Emergency Medicine Practice. 13 (11). Archived from the original on 2012-01-18. ^ Wu, MC; Liao, TY; Lee, EM; Chen, YS; Hsu, WT; Lee, MG; Tsou, PY; Chen, SC; Lee, CC (November 2017). "Administration of Hypertonic Solutions for Hemorrhagic Shock: A Systematic Review and Meta-analysis of Clinical Trials". Anesthesia & Analgesia. 125 (5): 1549–1557. doi:10.1213/ANE.0000000000002451. PMID 28930937. ^ Gamper, Gunnar; Havel, Christof; Arrich, Jasmin; Losert, Heidrun; Pace, Nathan Leon; Müllner, Marcus; Herkner, Harald (2016-02-15). "Vasopressors for hypotensive shock". The Cochrane Database of Systematic Reviews. 2: CD003709. doi:10.1002/14651858.CD003709.pub4. ISSN 1469-493X. PMID 26878401. ^ Diez, C; Varon, AJ (December 2009). "Airway management and initial resuscitation of the trauma patient". Current Opinion in Critical Care. 15 (6): 542–7. doi:10.1097/MCC.0b013e328331a8a7. PMID 19713836. ^ a b Martí-Carvajal, Arturo J.; Solà, Ivan; Gluud, Christian; Lathyris, Dimitrios; Cardona, Andrés Felipe (2012-12-12). "Human recombinant protein C for severe sepsis and septic shock in adult and paediatric patients". The Cochrane Database of Systematic Reviews. 12: CD004388. doi:10.1002/14651858.CD004388.pub6. ISSN 1469-493X. PMID 23235609. ^ a b Boyd, JH; Walley, KR (August 2008). "Is there a role for sodium bicarbonate in treating lactic acidosis from shock?". Current Opinion in Critical Care. 14 (4): 379–83. doi:10.1097/MCC.0b013e3283069d5c. PMID 18614899. ^ Finfer, Simon R.; Vincent, Jean-Louis; Vincent, Jean-Louis; De Backer, Daniel (31 October 2013). "Circulatory Shock". New England Journal of Medicine. 369 (18): 1726–1734. doi:10.1056/NEJMra1208943. PMID 24171518. ^ Cecconi, Maurizio; Backer, Daniel De; Antonelli, Massimo; Beale, Richard; Bakker, Jan; Hofer, Christoph; Jaeschke, Roman; Mebazaa, Alexandre; Pinsky, Michael R. (2014-12-01). "Consensus on circulatory shock and hemodynamic monitoring. Task force of the European Society of Intensive Care Medicine". Intensive Care Medicine. 40 (12): 1795–1815. doi:10.1007/s00134-014-3525-z. ISSN 0342-4642. PMC 4239778. PMID 25392034. ^ a b Irwin, Richard S.; Rippe, James M. (January 2003). Intensive Care Medicine. Lippincott Williams & Wilkins, Philadelphia & London. ISBN 978-0-7817-3548-3. Archived from the original on 2005-11-07.